It's not often that an application can change the freight industry. People like to do it 'the way we've always done it', and let's face it — change can be hard. But what if you found software that made managing freight much easier, and saved your business a lot of time and money in the process? That's exactly what Freightview does. We have created easy-to-use freight management software that consolidates all of your negotiated freight rates into one place so you can compare rates and book your shipments. It's a breath of fresh air in an often-antiquated space. Never overpay on your freight again. Freightview makes it so easy to compare your rates, you'll never overpay for your freight again. We pull all of your rates from your carriers and display them on one clean, easy-to-use interface. You'll never have to go to multiple clunky websites to rate shop again, and loading tariffs is a thing of the past. If you negotiate new rates with a carrier, our freight management software displays them instantly. Whatever is in your carrier's system is immediately reflected in ours. Shop your spot quotes as well. Usually, shipping LTL with Freightview is a matter of comparing your negotiated rates and choosing the best option. But sometimes you may have a large or heavy shipment that would be better suited for a spot quote. Our freight shipping software can help you send and manage real time bids for shipments regardless of equipment type. Just another way that Freightview supports the complete shipping process. Get your freight out the door. Comparing rates is great, but the real power of our freight management software lies in booking your shipment. Discover how easy it is to schedule a pickup and get your goods to the end customer. All of your products and contacts are remembered, so the process is easy and painless. Quit entering redundant data. Start getting stuff done. Print perfect BOLs and labels. 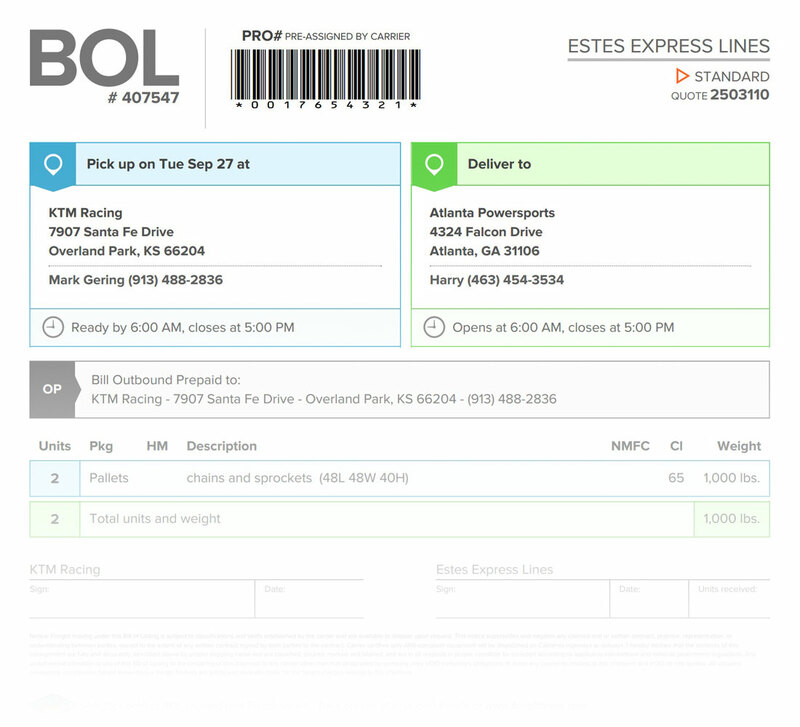 Freightview lets you print your Bill of Lading (BOL) and labels – just one more thing that we have designed with you in mind. 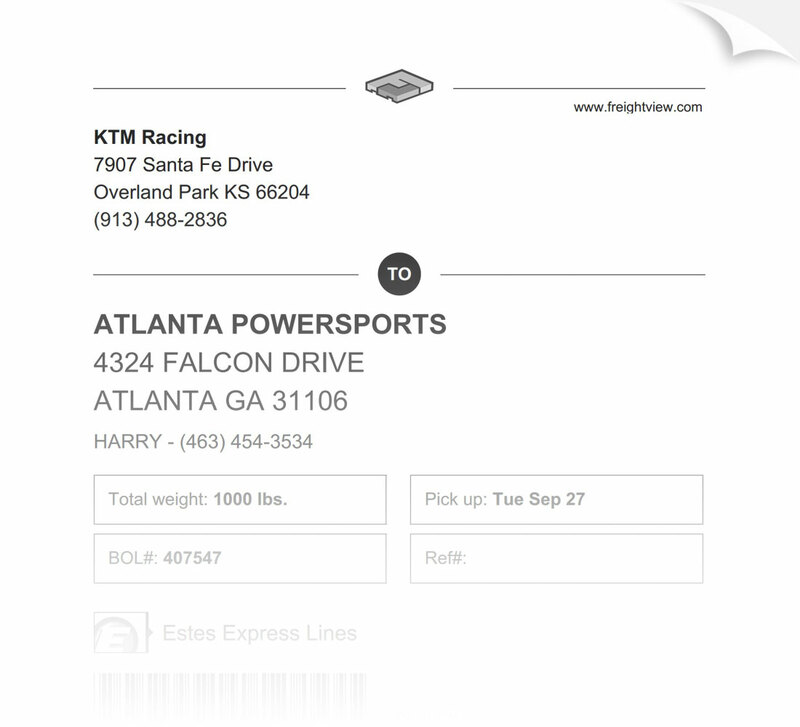 Our printing interface gives you many options to make your shipping process efficient. You can print labels on a continuous printer, place multiple labels on one sheet, and position sheets so you don’t waste material. And, who says BOLs can't be beautiful? There is no detail too small for Freightview. Get peace of mind with tracking. Once your shipment is out the door, it is never out of your view. Our freight tracking software updates in real time from pickup to delivery. You can get your status at a quick glance, or drill down for more in-depth information. Freightview provides many options for analyzing your shipping patterns. See what carriers you use most and in what lanes. Leverage your data to negotiate better rates and stay up to date on spend. Need to get a better overview of freight spend in relation to other business expenses? Export your shipment data to a CSV file for customized reports. Easy set up is important. Software that is hard to get running is not worth your time even if it promises great features afterwards. Virtually all transportation management systems are a complete pain to setup. You sometimes have to wait weeks to connect to your carriers, and then you have to wait for somebody to manually load your tariffs into a system. When things change, you have to be in communication with someone to update your changes. None of this applies to Freightview. You will be connected to your carriers in less than 48 hours, some of them in minutes. We don't load tariffs or use EDI, so changes to your tariffs happen instantly using API technology. Beautifully designed and supported TMS. One of the first things you will notice about Freightview versus our competitors is that our freight management software is beautifully engineered and designed. We think through user experience and interfaces and take great pride in making our app powerful and easy to use. Put it to the test versus any competitor and you will see and feel the difference. We don't build on top of a bloated framework or limit ourselves with proprietary software. We built our software from the ground up with one goal - provide the best TMS on the planet with world-class support. Try 14 days free with no obligations. We are so convinced that our freight quote software will change the way you ship that we offer all of our users a 14-day trial that is completely free with no hooks. You don't even have to enter a credit card number to try us out. If you love Freightview, you simply enter your information at your own will before the 14 days expire. We don't need a hook or disclaimers because we believe in our product and think you will too.